DiscountMags.com is holding a “hobby” sale until midnight tonight in the US. 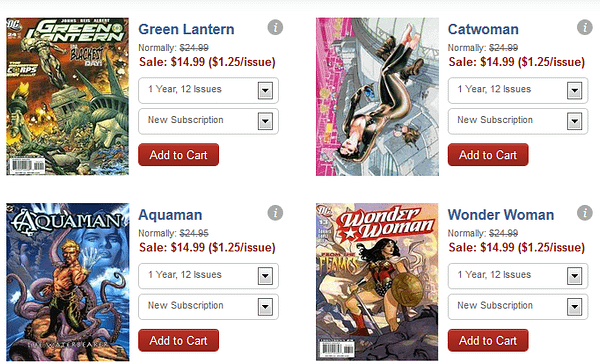 Which includes comics, so they are offering subscriptions to DC Comics for $14.99 a tear, or $1.25 an issue. The titles included are Supergirl, Green Arrow, Green Lantern Corps, Wonder Woman, Aquaman, Teen Titans, Catwoman, Superman, Batman & Robin, Batman: The Dark Knight,Scooby Doo, Mad Magazine ($2 an issue), Loony Tunes and… Young Justice and Justice Society of America. The latter two of which don’t exist anymore. And haven’t for over two years. I expect you might get Earth 2 instead of JSA. But Young Justice? No idea.